The Durotriges were one of the Celtic tribes living in Britain prior to the Roman invasion. The tribe lived in modern Dorset, south Wiltshire, south Somerset and Devon east of the River Axe and the discovery of an Iron Age hoard in 2009 at Shalfleet, Isle of Wight gives evidence that they lived in the western half of the island. After the Roman conquest, their main civitates, or settlement-centred administrative units, were Durnovaria (modern Dorchester, "the probable original capital") and Lindinis (modern Ilchester, "whose former, unknown status was thereby enhanced"). Their territory was bordered to the west by the Dumnonii; and to the east by the Belgae. Durotriges were more a tribal confederation than a tribe. They were one of the groups that issued coinage before the Roman conquest, part of the cultural "periphery", as Barry Cunliffe characterised them, round the "core group" of Britons in the south. These coins were rather simple and had no inscriptions, and thus no names of coin-issuers can be known, let alone evidence about monarchs or rulers. Nevertheless, the Durotriges presented a settled society, based in the farming of lands surrounded and controlled by strong hill forts that were still in use in 43 AD. 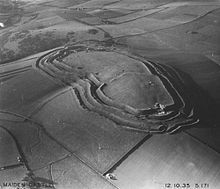 Maiden Castle is a preserved example of one of these hill forts. The Celtic tribes of Southern Britain showing the Durotriges and their neighbours. The area of the Durotriges is identified in part by coin finds: few Durotrigan coins are found in the "core" area, where they were apparently unacceptable and were reminted. To their north and east were the Belgae, beyond the Avon and its tributary Wylye: "the ancient division is today reflected in the county division between Wiltshire and Somerset." Their main outlet for the trade across the Channel, strong in the first half of the 1st century BC, when the potter's wheel was introduced, then drying up in the decades before the advent of the Romans, was at Hengistbury Head. Numismatic evidence shows progressive debasing of the coinage, suggesting economic retrenchment accompanying the increased cultural isolation. Analysis of the body of Durotrigan ceramics suggests to Cunliffe that the production was increasingly centralised, at Poole Harbour (Cunliffe 2005:183). Burial of Durotriges was by inhumation, with a last ritual meal provided even under exiguous circumstances, as in the eight burials at Maiden Castle, carried out immediately after the Roman attack. The Durotriges, and their relationship with the Roman Empire, form the basis for an ongoing archaeological research project directed by Paul Cheetham, Ellen Hambleton and Miles Russell of Bournemouth University. The Durotriges Project has, since 2009, been reconsidering the Iron Age to Roman transition through a detailed programme of field survey, geophysical investigation and targeted excavation. To date the programme of work has concentrated upon an enclosed late Iron Age banjo enclosure containing round houses, work surfaces and storage pits, a Late Iron Age cemetery and two Roman villas. ^ Bruce Eagles, "Britons and Saxons on the Eastern Boundary of the Civitas Durotrigum" Britannia 35 (2004:234-240) p. 234. ^ "The Durotriges were a close-knit confederacy of smaller units centred on modern Dorset," writes Barry Cunliffe, Iron Age Communities in Britain: An Account of England, Scotland and Wales from the Seventh Century BC Until the Roman Conquest, 4th ed. 2005:178, in beginning his Part II.8 "The tribes of the periphery: Durotriges, Dobunni, Iceni and Corieltauvi" (pp 178-201). ^ Several homestead sites have been excavated in Cranborne Chase. ^ Cunliffe 2005: fig. 8:2. ^ Eagles 2004: 234 and map, fig. 5. Paul Cheetham Ellen Hambleton, Miles Russell and Martin Smith (2013), Digging the Durotriges: Life and Death in Late Iron Age Dorset. Current Archaeology 281, 36-41.